“Dulce periculum est” (danger is sweet), ends the ode from Horace set by Wolfgang Rihm, Quo me rapis. The poet is going where “nothing is slight, mundane or mortal”, yet relishes the unknown. It’s a metaphor for art. Xenakis, a political radical, dedicated Nuits to “unknown political prisoners……the thousands of forgotten whose very names are lost”. Hence the fragmentation of sound. He uses broken syllables from Sumerian and ancient Persian texts. Phonemes express the idea of half-heard “voices”, and of ruthless suppression. Polyphony creates tumult more powerfully than straightforward word setting. In its own way, Nuits is as concisely aphoristic as a Kurtàg miniature, for the voices here symbolise vast forces, thousand of people silenced over many centuries. Exaudi employs a range of techniques like growls, whistles, the chattering of teeth to expand in sound the idea of fragmented words, each fragments building up a powerful wall of sound. Some of the wailing vowel sounds are held so long it’s as if Exaudi members were practising circular breathing. This makes the sudden, last syllable sound even more distressing, as it cuts off, strangled, in mid air. Harding Mahler 10 new ! “Mahler goes in such an extreme direction. The music is in a way so modern and unexpected, that if you listen to it a first time it’s very possible to be confused by the modernity and the extreme nature of the musical language”. It's Proms time again and we can all listen together ! This gives links to the schedule and details of how to listen from all over the world. On a summer Sunday afternoon, out in the countryside around Aldeburgh, do you really want doom and gloom ? But if you like Lieder, doom and gloom are must haves ! So it was nice to sit in Blythburgh church where the walls, floors and ceilings contain tombs and listen, to a nice programme of deathridden Schubert. Like Totengrabers Heimweh where the gravedigger has just finished yet another grave for someone and thinks,"Gee, that's cool and peaceful ! Wish I were dead" He looks at a cross nearby, and BINGO ! He gets his wish and drops dead, into the welcoming hole. But Goerne, that's the Man.....His concert at the Wigmore Hall was in another league altogether even tho' something was wrong with P-L Aimard, who is usually pale but on this occasion was as white as expensive "High Bright" printer paper. The interaction between the two really was something. After decades of listening to Lieder (yes) , concerts like this show that there is always something to learn from. Haydn : Symphony no 22 "The Philosopher"
Mozart: Piano Concerto No 26 "The Coronation"
Haha ! Try this one at home and see why it is so interesting. It operates on many levels - celebration music, the idea of play, experiment, aphorism, questions, dialogue etc. Lots to get from it that might not catch the ear on a single hearing. The "obvious" cliche there is that it's mixing Mozart and Haydn with Kurtag, Ives etc. But it's not nearly as simple as that. Note the Mozart and Haydn pieces, not big, famous blockbusters but pieces which are fairly open ended. The Mozart for example allows for extended improvisation and isn't "complete" in the formal sense. And the Haydn is a kind of exploration of the possibilites of symphonic form. So, "old" as they may be they are "new" in spirit, (and were new music in their time). Then the Kurtag, Webern and Schoenberg miniatures, each concise explorations....played without a break, then Ives The Unanswered Question. It's was wonderful to hear Ives framed in this way, a kind of "coronation". 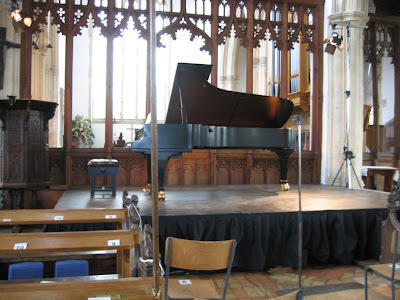 This was a very high profile concert indeed, the first real music concert of the current Aldeburgh Festival. Aldeburgh is unique. It was founded by Benjamin Britten but is definitely not a Britten exclusive. On the contrary. Look it up on google for an idea of what they do. All kinds of people come tho' it's way out in the country and hard to reach without a car. (In England lots of people don't drive). Lots of serious music folks from Europe and also lots of ordinary local people for whom it's the main event of the year. It's an excellent mix for exactly that reason. For me it was wonderful to hear what the locals thought of Ives. In this context they seemed to immediately "get" where Ives was coming from, it was a joy to hear how thrilled they were. These days, there's a lot of nonsense about atonality "having" to be difficult and impossible. People swallow the myth and switch off. Instead here they were just presented with Ives on his own terms, and no prejudices at all ! Before the concert someone asked Aimard who conducted, "Will Schoenberg ever be popular". If the guy was expecting Aimard to sneer at Schoenberg, he was wrong. Aimard said "Why should anyone HAVE to be popular?" It's more important that composers have integrity and ask the questions than pander to "popular" values. And this audience proved that ordinary people can respond, given a chance. Here's a hilarious review of Messiaen's St Francis of Assisi in Amsterdam. A lot of it I think is getting into Messiaen's mind set. Once you slow down, the repeats repeats repeats are actually quite fun. Here's where you can buy the reissue of the DVD set of this Chinese opera. Have a look ! GREAT pictures ! This is also one of the good sites for Chinese music and DVDs in general. It's the production first heard in 1998, but without the beautiful pink silk presentation box it was originally released in. Please see 6he detailed review by clicking on the link "Chinese opera" at the right edge of the screen. There is quite a lon on kunqu and Chinese music on this blog. Messiaen and Chinese opera ? Messiaen and Chinese opera ? But yes ! These last few weeks I've been listening to Messiaen's St Francis of Assisi and to the Chinese Kunqu Opera The Peony Pavilion. Maybe that colours my impressions. But think about it. Messiaen writes humongously long pieces comprising of many episodes. So does Mu Dan Ting (Chinese for Peony Pavilion). Both can be appreciated in smaller doses. Traditionally in Chinese opera you can walk in and out, go eat (we're Chinese !!!! ), whatever because you "know" the wider picture and can pick up. Similarly, most people "know" the gist of Messiaen's religious beliefs. Like the Stations of the Cross, you can focus on any one aspect at a time because you know the context. 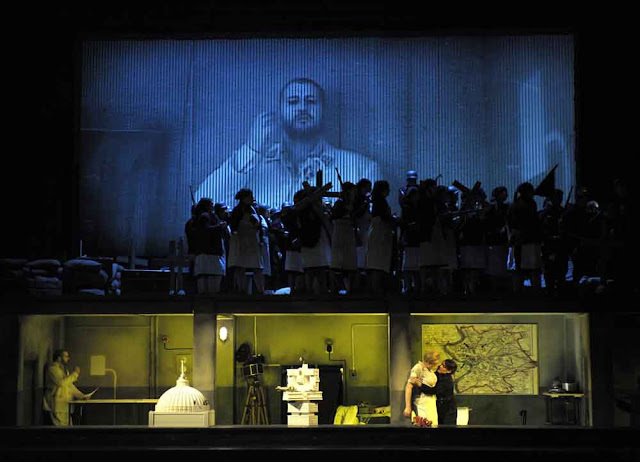 Yesterday i was in Amsterdam t0 see the new Audi production of Messiaen's opera Francis of Assisi. All 6 and 1/2 hours !!! The first act's about philosphy. No action, plot etc just guys talking until the leper appears, like light relief. Maybe that's designed to drive away those who can't cope with ideas and want action at all costs. The next two acts are livelier so if you've past the test of the first, you're part way there. I dozed off in the first act as there was no air conditioning in the crowded auditorium and I'd drunk a bit of wine. But that, too, tells something about the frame of mind you need to elate to St Francis. You've got to get out of "normal" mode. To a monk, 6 1/2 hours of contemplation is no big deal at all. So to get St Francis you have to get away from the frantic stressed out crazy world outside and enter monk mode. It's not that difficult. People lived less hectic lives in the past, and took their time. Same with Chinese opera. You don't need to grab it all at once. Dim sum, so to speak, small doses that build up.... Messiaen restructures the idea of time. Slow down, he says, and savour my dim sum, don't wolf it down and rush out. Useful lesson in life. Then the orchestration ! All that percussion, yet also the idea of silence, of small, expressive details that build up to a whole. And the sense of fluidity. When i was a kid, we used to play Chinese opera. As long as you had an idea of the plot and mannerisms, like hand movements amnd singing conventions, there was a fantastic amount of freedom and improvisation. We kids used to sing "Ai, yah yah...." and flutter about, our arms held in expressive angles while other kids beat time on their lunch boxes. 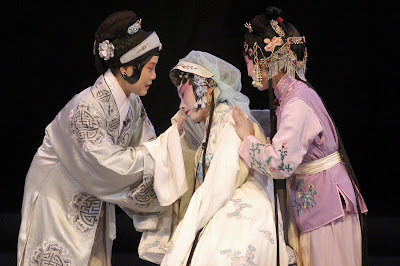 Kunqu opera may be 700 years old, but it's a living art, with lots of freedom within form. Similarly, Messiaen writes formal notational scores, but gives a lot of interpretative freedom. Very idiomatic, Metzmacher's conducting. Even the ondes martenot and wind machine sounded beautifully integrated - no horror movie connotations here.